Revolutionary technology is at our fingertips. 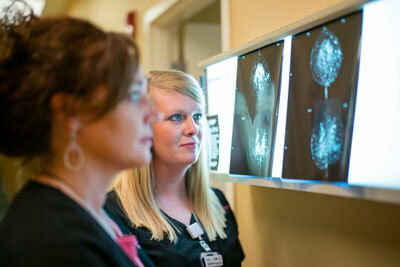 At Southern OB/GYN, we’re proud to be the first facility in Lowndes County to offer Genius 3D Mammography. This new technology has proven to detect 41% more invasive breast cancers and reduce false positives by up to 40%. With early detection, the five year survival rate is now almost 100%. Also known as digital breast tomosynthesis, this screening tool is the best way to discover signs of cancer at the earliest possible and most treatable stage. It converts images into a stack of very thin layers or “slices,” building a three-dimensional reconstruction of the breast that is much clearer to read. 3D mammography is performed in conjunction with a traditional 2D digital mammogram to create a more complete picture of breast health. A helpful analogy for understanding 3D mammography is thinking of these retrieved images as the assembled pages in a book. If you look at a closed book, you can only see the cover rather than all of the pages in between — but when you open it up; you can flip through the entire book page by page to see everything in great detail. Due to more clear diagnostic readings, 3D may reduce the need for biopsy in certain instances by clarifying vague asymmetries versus a mass. Fortunately, 3D mammography may require less compression than traditional mammography because it’s no longer necessary to compress and spread the breast tissue exactly parallel to the detector. 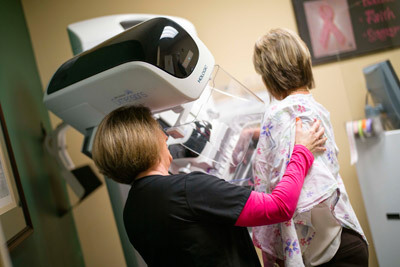 As is typical with any mammogram exam, some women experience minor discomfort and others experience no discomfort at all.